On this day, twenty three years ago at 7:02 PM my baby girl was born. It had been a twenty-five hour labor and at times it was pretty intense (as I remember it). Even though I had been to birthing classes and thought I could handle natural childbirth, I was definitely not prepared for the pain. Call me a wimp – it was hard. In birthing class the instructor had done all she could to help us “imagine” a very hard contraction and we all did the best we could. But who imagines that kind of pain? Well, not me. I had no clue. Suddenly there I was in the birthing center at Ashland Community Hospital screaming my head off. At one point, perhaps twenty two hours into labor, I lost it – I simply forgot how to breathe. When the contractions came I tensed up and held my breath. The nurse who was on duty kept telling me to breathe… but somehow I had forgotten how to do that. A short time later, as I held the hand of the nurse with my left hand and my husband to the right I felt a contraction coming. I tensed again and instead of screaming I chose to bite down on my left hand. And it didn’t even hurt. When I looked at my hand I saw that instead of biting my own hand I had bitten the hand of the nurse! Tonight, I brought a spinach, roasted pepper and caramelized onion quiche to the birthing center at Ashland Community Hospital to thank the nurses for the work that they do. It is such a wonderful gift that they give to all of the families that have their babies there. And I am very thankful for their efforts. And to that nurse whose hand I bit, I really am so sorry. It was wonderful to hear your birth story 23 years later and see that your eyes still teared up as you told the story. 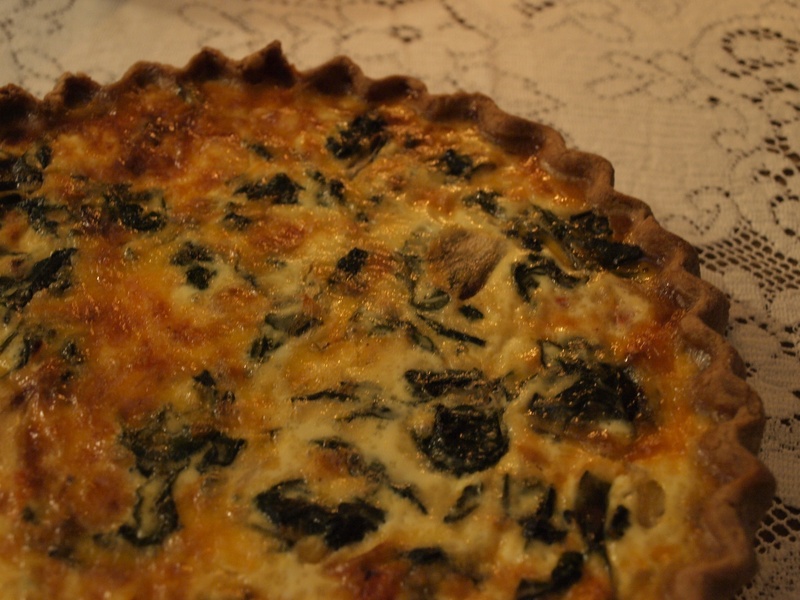 The quiche is delicious. From all of the nurses who work at the Birth Center, I can say that we are lucky to be able to impact the lives of the families we serve. Blessings to you and happy “Birth” day to you.